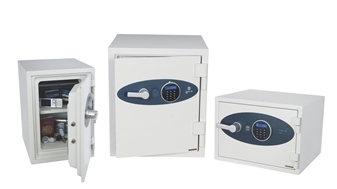 A modern, compact, high security, fire resistant safe designed to meet the need for residential and business use. Ideal for any school, office, or organisation where sensitive documentation needs to be protected. 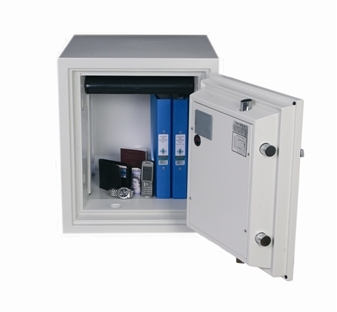 The body of this range of safes is constructed from galvanised steel plate with a virtually airtight recessed curvature door, which prevents fire and smoke damage to the contents. The door is secured using a high security electronic lock with programmable user and manager codes up to 8 digits in length. The safe is ready prepared for basefixing to the floor with bolts supplied. The added security offered by this method will deter even the most experienced criminal. 60 minutes fire protection at temperatures of 927°C for paper documents to International Standards UL 72 Class 350 – 1hr and GB 1970. The safe is also drop tested from 10 metres to simulate falling through the floors of a burning building or being buried under a collapsing building. 60 minutes fire protection at temperatures of 927c for paper documents to International Standards UL 72 CLASS 350 - 1hr and GB1970 and cd/dvd to SP specification. The extremely attractive white colour finish compliments or business and disguises a spacious interior. 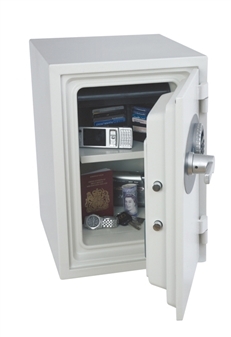 This safe is recommended for a maximum cash risk of £2000 or £20,000 valuables. 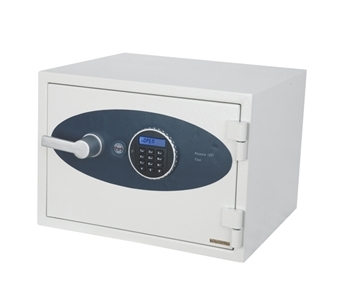 Fitted with a high security digital lock programmable with users own code of up to 8 digits, colour coded LCD display confirms status of battery and input codes. To warn of attack or unauthorised entry the integral security alarm activates and emits a high volume siren to deter possible criminal action. Ready prepared for floor fixing with fixing bolts supplied.